Most of you know about night mode. 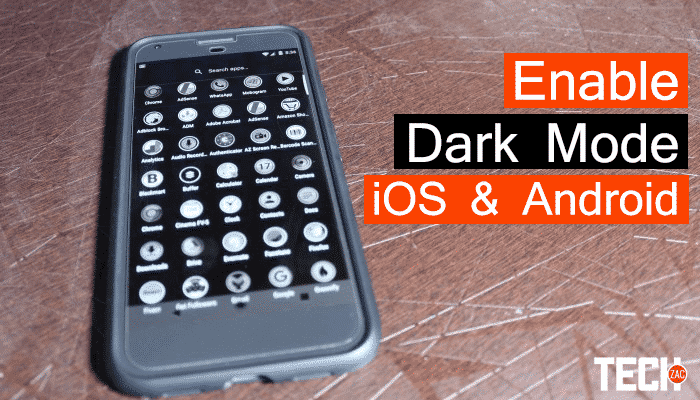 But, do you know how to enable dark mode in iOS 10 and Android? The Night mode is available for both Android and iOS users to protect your eyes from the blue light. Electronic gadgets like smartphone, tablet, computer emits blue light that causes a headache and eyestrain. The Night Shift mode minimizes this blue light, making the screen colors look warmer and more yellow. The harmful blue light mainly affects your eyes in the night time. That’s why we sleep at the night time and work in the night time. Previously, I shared an article on how to enable dark mode in YouTube to protect your eyes at night. Nowadays, most of the popular websites are working on the black color to protect user’s eyes. Every people loves to watch videos or surf the Internet on their smartphones. But, looking at your screen for the late night may cause eye diseases. So, you should turn on the dark mode in iOS and Android devices. Is Dark Mode same as the Night Mode? No. These two features have different concepts. When you enable Night mode, it turns your screen gray to reduce the blue light. But, the dark mode turns your interface darker; providing more convenient viewing experience, especially in the night. Night Mode adjusts the color overall, while Dark Mode just adjustments some components of your screen. The brightness of the screen will no longer strain your eyes. If you love reading at night on your smartphone, then this is the best way to protect your eyes. This feature was introduced in OS X Yosemite back in 2014. But, now this feature available for the latest iOS 10 and Android N as well. Before jumping to the procedure, make sure that you are using the latest mobile operating system in order to tweak your settings. This feature is tested on my iPad Mini having software version 10.3.2. This feature is available for both iPhone and iPad. Let’s enable dark mode in iOS 10 for a more convenient reading experience. 1) Open Settings app and navigate to General → Accessibility → Display Accommodations. 2) Here, turn on “Invert Colours” switch. This option will invert the colors on your iPhone or iPad, making more hassle-free to view the screen at night. 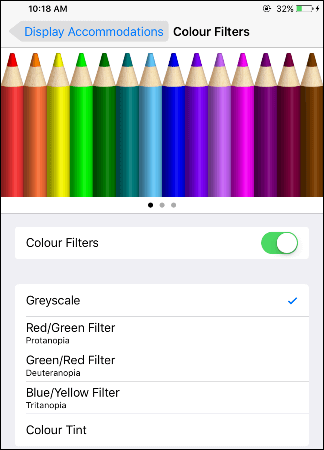 3) Next up, tap on “Colour Filters” and enable the switch on the next screen and select Grayscale. It’ll turn your screen more darker. 4) After that, swipe up from the bottom of your screen of your iDevice and drag the brightness slider in the middle. That’s it. You’ll see an adverse effect in all of your photos and videos. 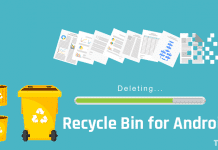 But, you’ll read your articles more conveniently in the browser or any reader. This mode is best for night reading without hurting your eyes. If you want to watch videos on YouTube or any other app at night, then disable the “Invert Colours” option; only enable the “Grayscale” mode. 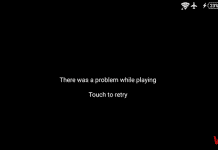 The Grayscale option will remove the colors from your screen, and the videos turn black and white. You can’t say this trick as a complete dark mode, but it makes your screen more pleasant for reading texts. The best thing is that it doesn’t burn your eyes at night and help you have a better sleep. As like the iOS devices, you can also enable dark mode in Android phones and tablets. I have tested this feature on Android Lollipop, Marshmallow, and Naught. Let’s do it quickly. 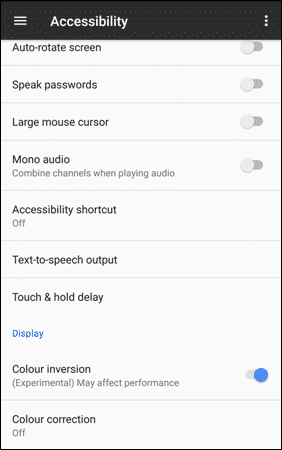 1) On your Android phone open Settings → Accessibility. Here, enable the “Colour inversion” toggle under the Display section. It’ll instantly change the color of your display. 2) After that, go back to the main Settings and open “Developer Options”. 3) Scroll down to “Hardware accelerated rendering” section and change the “Simulate color space” to “Monochromacy”. 4) You can adjust the brightness level of your phone to 50% for better readability. That’s it. This was the tutorial on how to enable Dark Mode in iOS 10 and Android devices. Generally, this feature turns your background interface to black and make the text to white color. 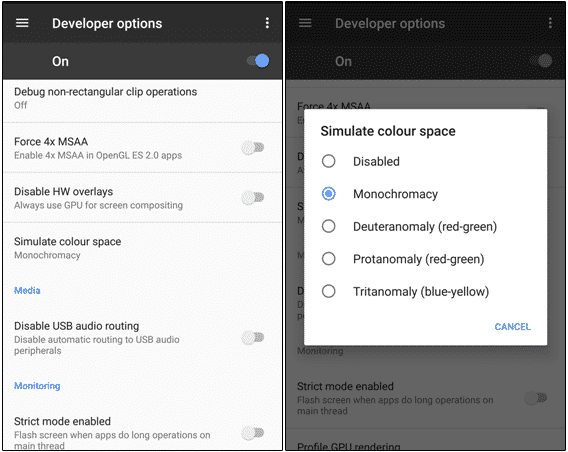 Some apps in Android and iOS already have dark mode enabled by default. Twitter also rolled out an identical dark mode feature recently called Night Mode. Hope you enjoyed this article. Don’t forget to share with your friends. I am happy that it helped you.